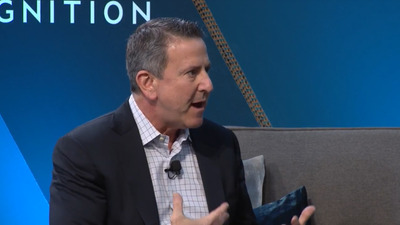 Business InsiderTarget CEO Brian Cornell took a shot at Walmart. He made the comment during a panel discussion at Business Insider’s IGNITION conference in New York on Thursday. Cornell said Target focuses its innovation research on ideas that can be rolled out to stores and online within a three-to-five-year time frame. Cornell made the remarks at Business Insider’s IGNITION conference in response to a question about retailers experimenting with store-of-the-future concepts. In response, Cornell said: “Experimentation is interesting but if I can’t scale it – if i can’t do it 1,800 times – it’s not going to add a lot of enterprise value.”The number 1,800 is a reference to the number of Target stores in the US. He said he is specifically focused on innovations that Target can roll out in stores and online within a five-year time frame. To assist in that process, Target has partnered with the venture capital firm BCG Digital Ventures to launch a 14-week “innovation sprint” aimed at coming up with new ideas for growing the retailer’s business. The project involves Target managers teaming up with BCG Digital Ventures’ designers, engineers, and investors to generate ideas for new products and potential businesses. The 14-week “sprint” is coming to a close this week, and on Friday the teams will present their ideas to executives, Cornell said. “We’re going to see some pretty exciting ideas,” Cornell said.